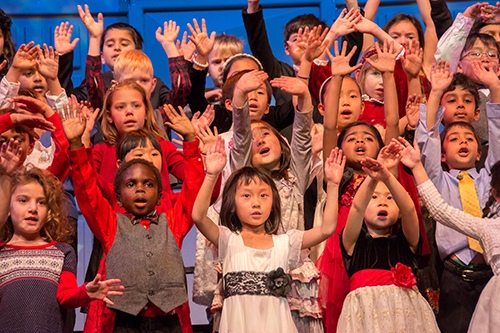 Just days before the holiday break, people eager for seasonal cheer flocked to the Bucknall Theater on Dec. 17 for the annual grade 1 holiday show, titled “Our Favorite Time of Year” and directed by Carena Montany. The homeroom classes of Imelda Kusuma, Cindy Proctor, Larissa Weaver and Rita Stone gathered on stage to sing a selection of odes to the holidays, including favorites such as “Santa Claus is Comin’ to Town,” “The First Noel” and “Jingle Bells.” Other notable performances included the Hanukkah-themed tune “Spin a Little Dreidel” and “Christmas Everyday” by Smokey Robinson and The Miracles, which featured a dance routine choreographed by Gail Palmer. Accompanying the singers during the concert were pianist Melissa Lin and violinist Toni Woodruff. Technical director Danny Dunn, assistant technical director Carol Clever and Dunn’s grade 5 technical theater students made sure the show ran well from start to finish.